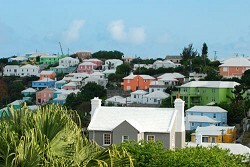 FRIDAY, FEB. 17: Are better days ahead for Bermuda’s real estate market? According to Susan Thompson, agency manager at Coldwell Banker Bermuda Realty, property values have fallen 10 to 30 per cent since 2008, depending on the market segment (condos, single dwelling family homes, and so on). Minister of National Security Wayne Perinchief told the House of Assembly today that the average number of days a property stayed on the market in 2011 was 263. Homes that have yet to sell averaged 435 days looking for a buyer. Ms Thompson said: “We have all heard the old adage, ‘be careful what you wish for’. Well, many have wished for it and it has happened; real estate prices in Bermuda have fallen quite noticeably in the last several years. “From a buyer’s perspective, a reduction in prices is music to their ears; but for property owners and potential sellers it’s a bit like fingernails across the blackboard … loud and unpleasant. Ms Thompson said there are signs that market may have started to turn around with some condos listing for as low $295,000 and standalone cottages as inexpensive as $495,000. She said: “While the total number of transactions are incomplete for 2011 (expected to have complete government records by mid-year), from the totals available thus far, condominiums have already outsold 2010 and we expect the same of single family homes. “This is good news because it means that the market is active and that price adjustments have made it possible for more people to enter the market. “According to economic experts, the recession in Bermuda started in 2009, which means we are three years into this slowdown that we have all experienced. These same experts believe that we are another year and a half away from recovery. “Despite this prediction, however, we are seeing a lot of activity for the start of the year; which is nearly equivalent to our 2009 transaction levels. Mr Perinchief said Government is giving the real estate industry a boost by revising some of the policies it instituted in 2007. It is allowing Bermudians to sell their properties to non-Bermudians if it’s in the ARV band of $177,000 or higher, which affects 250 properties. It is also getting rid of the policy that required Bermudians married to non-Bermudians to get a licence first. He said: “This change is to assist in stimulating the economy. Real estate in Bermuda has formed an important part of our people’s financial portfolio over the years and land is often the single most valuable asset. “All over the world, economic challenges have caused Governments to abandon traditional lines of political demarcation in the name of reversing negative growth and returning countries to prosperity. “Leadership demands that we examine our own policies through a new prism to match the challenges of the times. “This Government has done so and in these policy changes we have been responsive to the market demands while maintaining the necessary protection for our people. He added: “The other important change announced today is the relaxation of the license requirement for couples in which one spouse is non-Bermudian. “We have listened and taken stock of the evidence presented on the effect of this requirement on our people. The license requirement has added considerably to the time required to close property transactions and has adversely impacted the intended purchasers. He added since the 2007 change there had only been five objections to the advertised licence objections. There were still be a licence required for Bermudians married to non-Bermudians who want to purchase more than one home.